John Lennon and Yoko Ono famously spread their message of peace and love during a bed-in at a Montreal hotel in 1969, and now their iconic room has been commemorated with a new redesign. The storied Vietnam War protest took place at Fairmont's Queen Elizabeth Hotel in suite 1742, and that room has now been turned into a modern, liveable museum. 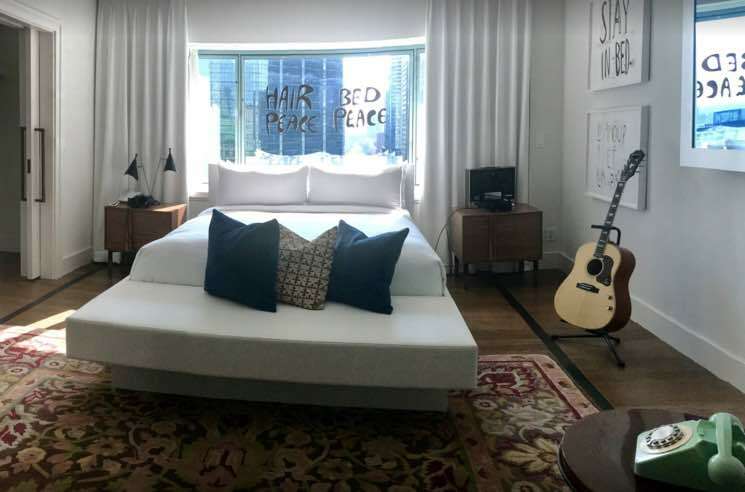 The couple's famous "HAIR PEACE" and "BED PEACE" signs have been immortalized as window decals, while additional furnishings inspired by Lennon and Ono's travels and lives (like lyrics inscribed in the walls, as well as portraits of the pair) have also been incorporated into the refurbished room. In a truly modern twist, virtual reality exhibits and archival TV and radio footage have also been added to the suite. A rotary phone plays a recording of Lennon preaching his position of peace, while VR headsets allow visitors to experience the bed-in from Lennon's perspective. Fans who want to step into the living history lesson can score a special rate on the famous suite if they book before the end of 2017 — it will only run you $1,969 a night. As previously reported, the peaceful pair are also set to be the subject of an Ono-approved upcoming biopic. Below, revisit the Bed Peace documentary, featuring footage filmed at the Montreal bed-in.